The objective of Aberforth Smaller Companies Trust (ASL) is to achieve a net asset value total return (with dividends reinvested) greater than that of the Numis Smaller Companies Index over the long term. The trusts portfolio is diversified and will normally consist of investments in over 80 individual companies. They are currently overweight in Industrials which account for 35% of the portfolio, Consumer Services 21% and Technology 11.5%. Share price total return for the past year is a very acceptable 13.9% compared to its benchmark index - Numis Smaller Companies index - Total Return of 10.6%. This is far better than the FTSE 100 return of -1.3% for 2015. The trust has been the best performing IT in my portfolio over recent years. Over the past 5 yrs average annualised returns for the smaller companies specialist are 16.7% p.a. It is widely accepted that smaller companies is one area where managed funds often produce better returns than the index. For example, the equivalent figure for Vanguard’s Global Small Cap index fund over the past 5 years is 8.6%. The board are proposing a final dividend of 17.85p making a full year increase of 5.1% to 26.00p per share. In addition, a special dividend of 2.75p is proposed as the trust has received seven such dividends from portfolio holdings. Revenue reserves have increased by a further 17% to £62.38m (2014 £53m). At the current price of around £10.80, the trust has a yield of 2.4% (excluding the special dividend) - obviously this has fallen over the past three years as the share price has risen so strongly. Although currently not one of the highest yielders in my SIPP, I am happy to continue with Aberforth for the longer term for delivery of growth and steadily rising income. Hi great post, do you know what discount Aberforth is trading on? 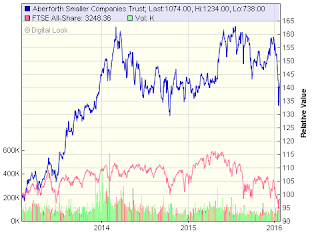 And how does it compare with Henderson UK smaller companies? I think both ITs are currently available on a discount to NAV of around 8% - you can compare on the AIC website. Finally getting round to investing in this one! Well, next month anyway! Thanks for the write up. I am guessing this may have been on your watch list for a while. I hope you get a good price for your entry point - the market volatility in the past month has provided some good opportunities for buyers. I hope it works out for you longer term! Thank-you for this post DIY Investor. I am on the look out for a smaller companies Investment Trust and I have book marked this for when funds become available. I see so many stratagies for for smaller company selection and they all fail when I try them. I just stick at the big ones and allow good professionals to do what I am no good at. Continued good luck in your investing and your blog. Souds like a good strategy Louis and good luck with your smaller companies selection when the time is right. This has done well for me but there are several other options which are probably equally as good.